Trees are absolutely essential to our physical surroundings. As the largest plants on the globe, they give us oxygen, absorb carbon dioxide, prevent soil erosion, cool the Earth, and provide habitats for wildlife and numerous botanicals. They also offer social and artistic value to our neighborhoods by increasing our quality of life and strengthening community pride. Simply put, our human environment could not exist without trees. That’s why it’s so meaningful that these urban forests, specifically those in the local area, are properly preserved and maintained. Teresa Damron is the general manager and co-owner (along with her husband, Nathaniel Sperry) of Eugene’s Sperry Tree Care, which provides traditional tree tending, as well as consulting services. She says it’s imperative that folks realize the significance of good tree maintenance, especially in preparation for the winter season. Damron recalls the massive 2016 ice storm that hit the Eugene-Springfield area. The storm led to ice-glommed trees crashing down onto cars, houses, and power lines. The storm resulted in a lot of costly damage, she says, pointing out that many preventative measures, such as pruning or weight reduction, could have minimized the damage. “We’re getting more ice storms now because of the climate changing,” Damron says, stressing the seriousness of locals preparing for future storms. Scott Altenhoff, urban forestry management analyst with the City of Eugene Public Works and Parks and Open Space departments, agrees with Damron’s philosophy of proactive tree care. 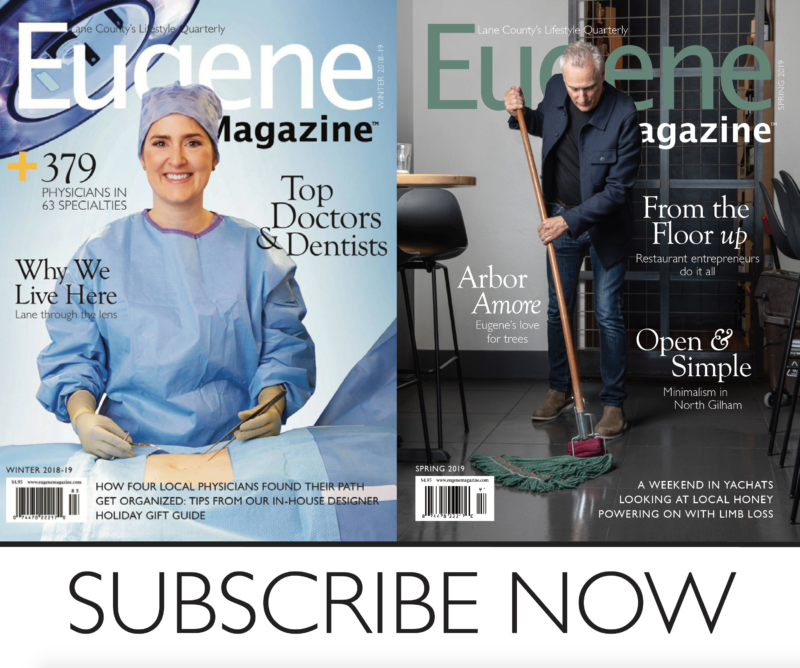 He says his organization’s mission is to maximize the social, economic, and environmental benefits of Eugene’s urban forest and to minimize its costs and liabilities by means of adaptive management and community. Rebecca Snowdale, volunteer and planting specialist with the Friends of Trees Eugene metro office, advises that for trees to grow properly, they need to be planted in the right soil. “It’s about putting the right tree in the right space,” she says. Friends of Trees is a nonprofit organization established 30 years ago in Portland for the sole purpose of teaching volunteers how to plant and maintain trees. Now, they’ve expanded to numerous chapters throughout the Pacific Northwest.